Students will be happy to follow the rules when they see these adorable rules on the wall! 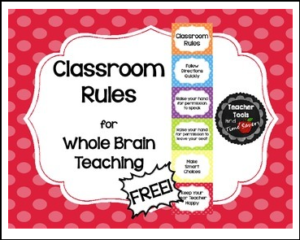 These are the popular rules used in Whole Brain Teaching. These rules match the other items in my ‘Cute Polka Dots’ collection. Check out all of the coordinating ‘Cute Polka Dots’ items like this one in my store! I hope you enjoy these! They will brighten up your classroom.